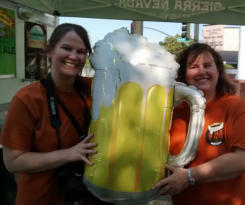 It was brainstorming that started with a need to liquidate an overstock of monogrammed wine glasses; it was magic and a huge leap that turned the thought process into one of Red Bluff’s and the North state’s most popular craft brew and beef tasting events, Beef ‘N Brew. 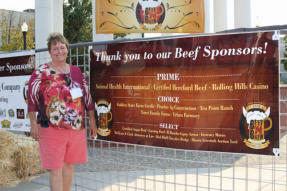 In the spring of 2009 the Tehama County CattleWomen, (TCCW) and the Downtown Red Bluff Business Association (DRBBA) joined talents and efforts to promote downtown businesses and the local beef industry. Two CattleWomen, one a producer and one a retail business owner got together to ponder an event where the CattleWomen could team up with downtown businesses to create an event that put feet on the floor in the businesses and promoted the local beef industry. Wine and the glasses were quickly set aside out of respect for Red Bluff’s ArtWalk that supported Tehama Counties then fledgling vineyards. Art Walk is held the first Friday in November. Beef ‘N Brew was the natural solution. There was also a need to bring back Red Bluff’s history of Street Dances. Plus there was a need to utilize the Cone and Kimball Plaza with the replica of the historic Zuckwiler’s clock tower the local Rotarians had restored. This was all accomplished by serving beef appetizer and brew tasting in the businesses from 5 to 8 PM and having a street dance with good local bands at the Rotary’s Cone and Kimball Plaza from 7 to 10. 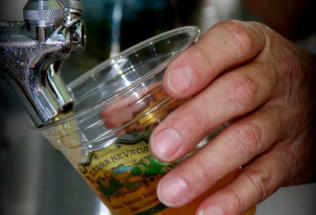 Tickets included all the tasting, the dance, a tri-tip beef sandwich and a Sierra Nevada 12oz brew at the dance. All of this and low ticket prices produced a winner for all concerned. The event took a lot of planning to prepare, for what has grown from 700 ticket holders the first year to the expected 2500 ticket holders this year. The day of event takes over 200 volunteers in the stores and on the street, from the CattleWomen, Downtown businesses and employees, city support, community leaders and other supporting agencies. Even though both organizations matched seed money the first year, it was never needed as Beef “N Brew has been successful since before the day of the first event. 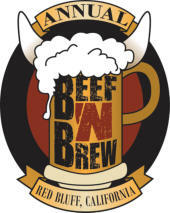 Beef ‘N Brew is a fund raiser that the Cattlewomen use to support local scholarships and youth in agriculture and the DRBBA uses the funds for beautification of the downtown business district and to support the county wide “Branding Project”. All the moneys go back into the community. 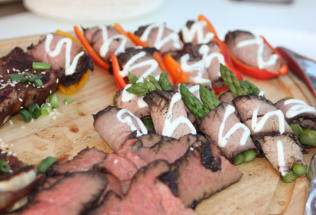 Beef ‘N Brew has been held in rain and shine, it is always fun and vacations are now being planned around it. Please join us. 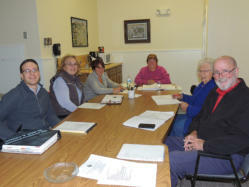 See Key Players to get acquainted with the dedicated committee members and supporting businesses. Please support these farms and businesses and thank you for shopping local.